We’re at Round 11, the final round of Swiss. After this match, only the Top 64 players will advance to the Single Elimination playoff with the top 4 players qualifying for this year’s World Championship! 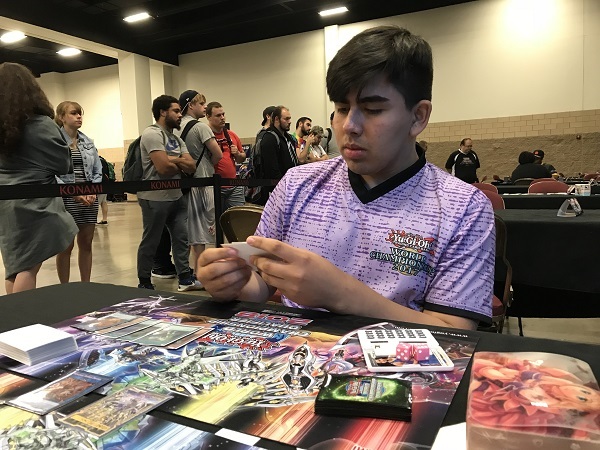 Brian Rayos from Los Angeles, California has Sky Striker Trickstars, a variation of the Deck he used to top YCS Dallas, the event in which he earned his WCQ invite. We just saw his opponent, Gabriel Vargas on a livestream Feature Match and he has Gouki Deck. A win will solidify a spot in the Top Cut. It’s time to Duel! Rayos won the roll and elected to go first. He started with Trickstar Light Stage, Trickstar Lycoris, 2 copies of Sky Striker Mecha – Hornet Drones, and Sky Striker Maneuver – Afterburners!. He started with Trickstar Light Stage to add Trickstar Candina to his hand. After the chain resolved Vargas activated Droll & Lock Bird to prevent further searching and drawing this turn. Rayos then activated Sky Striker Mecha – Hornet Drones to make a Token which was used to Link Summon Sky Striker Ace – Kagari whose effect let Rayos pick up Sky Striker Mecha – Hornet Drones which was activated then chained with the second one. Rayos then used Sky Striker Ace – Kagari and a Token to Link Summon Space Insulator and then used the other Token to Link Summon Linkuriboh! He then Normal Summoned Trickstar Lycoris and then used all the monsters to Link Summon Topologic Bomber Dragon! He passed there. Vargas started with Reinforcement of the Army to add Gouki Twistcobra to his hand. He Normal Summoned Gouki Suprex and used its effect to Special Summon the Gouki Twistcobra. Both monsters were used to Link Summon Isolde, Two Tales of the Noble Knights! All the effects activated, adding Gouki Headbatt, Gouki Suprex and Gouki Re-Match. 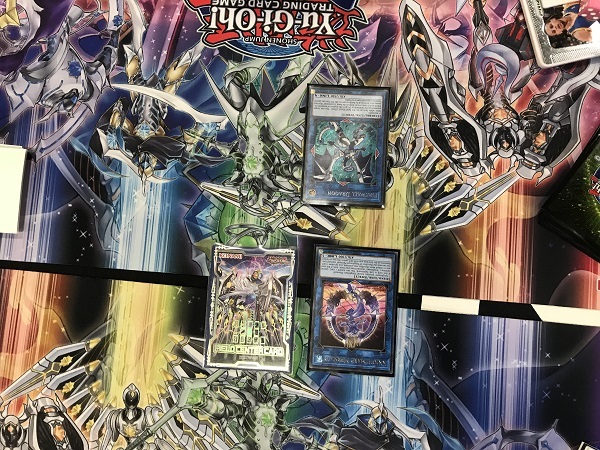 Isolde, Two Tales of the Noble Knights’s effect sent Divine Sword – Phoenix Blade to Special Summon Gouki Octostretch from the Deck. He then Special Summoned Gouki Headbatt by discarding Gouki Suprex. But because he put Headbatt into a zone that Isolde, Two Tales of the Noble Knights points to, Topologic Bomber Dragon’s effect destroyed all monsters in the Main Monster Zones! Vargas used the Gouki effects to add Gouki Riscorpio and Gouki Suprex from his Deck to his hand. He then activated Gouki Re-Match to Special Summon Gouki Octostretch and Gouki Headbatt from the Graveyard. He then brought his Divine Sword – Phoenix Blade back to his hand. 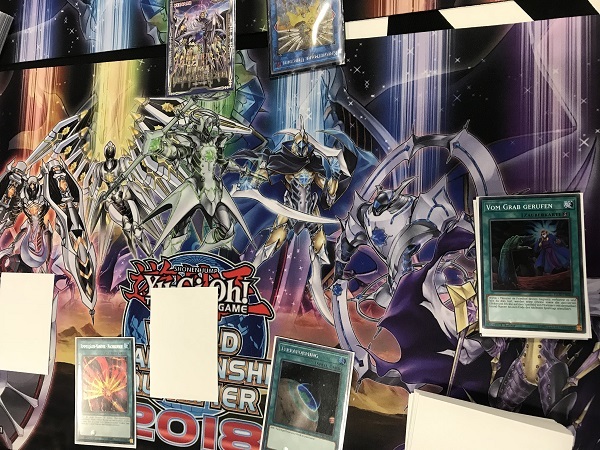 He sent Isolde, Two Tales of the Noble Knights and Headbatt to the Graveyard to Link Summon Knightmare Unicorn whose effect let Vargas discard Divine Sword – Phoenix Blade to send Rayos’s Topologic Bomber Dragon back to his Extra Deck. Vargas attacked directly with Knightmare Unicorn putting Rayos to 5800 LP. Rayos drew another Trickstar Light Stage. He activated Sky Striker Maneuver – Afterburners! to destroy Vargas’s Knightmare Unicorn then Normal Summoned Trickstar Candina and used her effect to add Trickstar Reincarnation. He then activated Trickstar Light Stage to add Trickstar Lilybell whose effect Special Summoned herself to the field. Lilybell attacked directly whose effect added the Trickstar Lycoris back to his hand. Lycoris came down to the field putting Lilybell back to his hand. He then had Trickstar Lycoris destroy Gouki Octostretch, with Vargas adding Gouki Bearhug to his hand and taking 400 damage from Trickstar Lycoris’s effect. Trickstar Candina attacked directly to leave Vargas at 4600. He Set Trickstar Reincarnation and passed. Rayos activated Trickstar Reincarnation in the Standby Phase of Vargas’s turn, forcing Vargas to banish 7 cards! He took 1600 damage dropping Vargas to 2600 LP. He activated Monster Reborn to Special Summon Isolde, Two Tales of the Noble Knights from his Graveyard, taking 400 damage from Trickstar Candina’s effect. He then activated Isolde’s effect, sending Noble Arms – Arfeudutyr to the Graveyard to Special Summon another Gouki Octostretch from the Deck. He then Normal Summoned Junk Forward and used it and Gouki Octostretch to Link Summon Knightmare Cerberus. He used Cerberus’s effect, discarding Instant Fusion to destroy Rayos’ Trickstar Lycoris while using Gouki Octostretch to add Gouki Re-Match to his hand from his Deck. He then brought Divine Sword – Phoenix Blade back to his hand by banishing 2 Warriors from his Graveyard. He sent Knightmare Cerberus to the Graveyard to Link Summon Knightmare Mermaid. Vargas discarded the Sword to Special Summon Knightmare Corruptor Iblee from his Deck. He then used Knightmare Corruptor Iblee and Isolde, Two Tales of the Noble Knights to Link Summon Knightmare Phoenix. He used Phoenix’s effect, discarding Sky Striker Mecha – Hornet Drones to destroy Rayos’s Trickstar Light Stage. Next, he activated Gouki Re-Match to Special Summon Gouki Octostretch and Gouki Twistcobra. Next, he banished 2 more Warriors to add Divine Sword – Phoenix Blade back to his hand. Next, he used those Goukis to Link Summon Knightmare Goblin. He discarded Divine Sword – Phoenix Blade for its effect, added Gouki Riscorpio and drew a card in the following chain. Next, he used the additional Normal Summon to Normal Summon Junk Forward. Trickstar Candina was only at 1000 because of Knightmare Mermaid’s effect. All of Vargas’ monsters attacked, destroying Trickstar Candina and leaving Rayos at 2400 LP to Vargas’s 2000 LP. 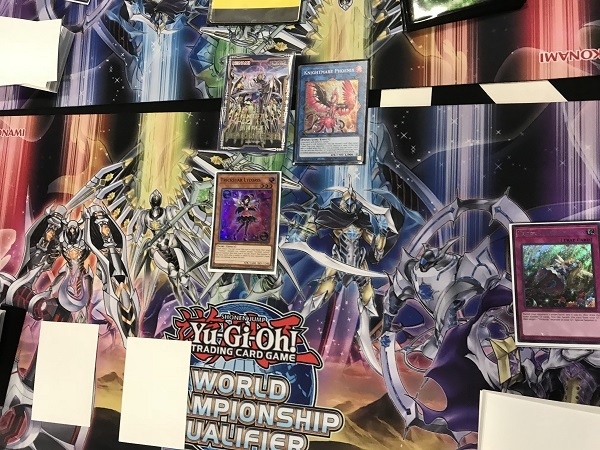 In Main Phase 2, Vargas sent Knightmare Goblin, Knightmare Phoenix and Junk Forward to the Graveyard to Link Summon Firewall Dragon. Rayos drew Droll & Lock Bird. He conceded and we’re moving to the second Duel! Rayos elected to go first. He started with a hand of Sky Striker Mobilize – Engage!, Sky Striker Mobilize – Engage!, Sky Striker Mecha – Hornet Drones, Sky Striker Mecha – Hornet Drones and Droll & Lock Bird. He activated Sky Striker Mobilize – Engage! to add Sky Striker Mecha – Hornet Drones to his hand which Vargas activated his own Droll & Lock Bird in response. Rayos then activated Sky Striker Mecha – Hornet Drones to make a Token which was used to Link Summon Sky Striker Ace – Kagari which picked up Sky Striker Mobilize – Engage!. He Set another Sky Striker Mecha – Hornet Drones and passed. Vargas activated Sky Striker Mobilize – Engage! to add his own Sky Striker Mecha – Hornet Drones which prompted Rayos to activated his own Droll & Lock Bird. Vargas activated Sky Striker Mecha – Hornet Drones to Special Summon a Sky Striker Ace Token which was used to Link Summon Sky Striker Ace – Kagari which added Sky Striker Mecha – Hornet Drones from his Graveyard back to his hand. He then activated Twin Twisters, discarding Called by the Grave targeting Rayos’s Set Sky Striker Mecha – Hornet Drones which he chained to Special Summon a Sky Striker Ace Token. Sky Striker Ace – Kagari destroyed the Token in battle. Rayos drew Trickstar Lycoris for turn. He activated Sky Striker Mobilize – Engage! to add Sky Striker Maneuver – Afterburners! to his hand which Vargas activated his second Droll & Lock Bird. He sent Sky Striker Ace – Kagari to the Graveyard to Link Summon Sky Striker Ace – Shizuku which was then sent to the Graveyard to Link Summon another Sky Striker Ace – Kagari! Rayos used Sky Striker Ace – Kagari’s effect to add back a Sky Striker Mecha – Hornet Drones then in a new chained activated 2 of them to make 2 Tokens. He used Sky Striker Ace – Kagari and a Token to Link Summon Space Insulator then used the second Token to Special Summon Linkuriboh! He then Normal Summoned Trickstar Lycoris and used all the monsters to Link Summon Topologic Bomber Dragon! He used it to attack and destroy Vargas’s Sky Striker Ace – Kagari. He Set Sky Striker Mobilize – Engage! and passed. Vargas Set one card and passed. Rayos drew, Normal Summoned Trickstar Candina and her effect was negated by Vargas’s Ash Blossom & Joyous Spring. Vargas took both attacks to leave him at 500 LP, dangerous with a Trickstar in play. Vargas Normal Summoned Knightmare Corruptor Iblee across from Topologic Bomber Dragon to have its effect destroy itself and Trickstar Candina. Rayos tried to attack for game but Vargas used Sky Striker Mecha – Hornet Drones to block the attack. Topologic Bomber Dragon attacked and destroyed it. Vargas drew and Set Ash Blossom & Joyous Spring and passed. Rayos attacked into the Ash Blossom & Joyous Spring to destroy it. He had 3 Set cards here. Vargas Normal Summoned Gouki Suprex and Special Summoned Gouki Headbatt with its effect. He sent the 2 monsters to the Graveyard to Link Summon Isolde, Two Tales of the Noble Knights. The effects let him add Gouki Re-Match, Gouki Twistcobra and Gouki Suprex. He also used Isolde, Two Tales of the Noble Knights’s effect, sending Divine Sword – Phoenix Blade to Special Summon Gouki Octostretch. He used both monsters to Link Summon Knightmare Unicorn. He used effects, but Rayos chained Called by the Grave to banish Octostretch. 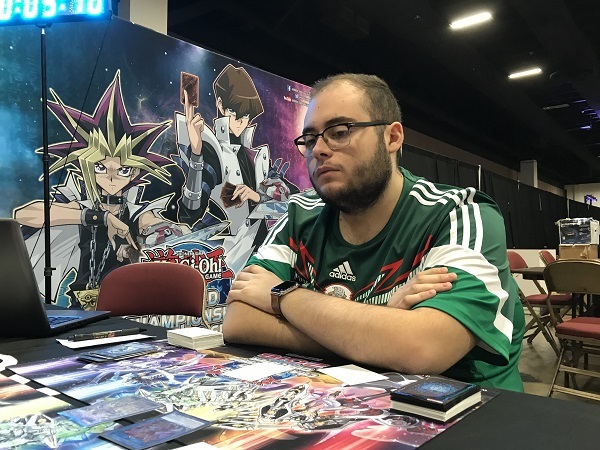 Rayos topped Terraforming, revealed it to his opponent and Vargas scooped his cards to move to the third Duel with 5 minutes left. Vargas elected to go first with 3 minutes left in the match. He Special Summoned Junk Forward, Normal Summoned Gouki Suprex and used both monsters to Link Summon Isolde, Two Tales of the Noble Knights. The effects let him add Gouki Headbatt and Gouki Riscorpio. Isolde, Two Tales of the Noble Knights’s effect let Vargas dump Divine Sword – Phoenix Blade to the Graveyard but Rayos chained Ash Blossom & Joyous Spring to negate Isolde’s effect. He passed. Rayos activated Sky Striker Mecha – Hornet Drones to make a Token which was used to Link Summon Sky Striker Ace – Kagari which added Hornet Drones back. He used Drones again to make a Token then used both monsters to Link Summon Knightmare Phoenix. He Normal Summoned Trickstar Lycoris and attacked with both monsters, clearing Vargas’ field and leaving Vargas at 6100. Rayos Set 3 cards and passed. Vargas drew and Rayos activated Trickstar Reincarnation, having Vargas banish his hand to draw a new hand. He used Sky Striker Mecha – Hornet Drones to make a Token but with less than a minute left there was no way to change LP enough to overcome the deficit! Brian Rayos ends Swiss with a record of 9 wins, 1 loss and 1 draw. We may see him in the playoffs!